Root vegetables are drizzled with olive oil then roasted until sweet and caramelized in this simple but satisfying winter vegetable soup recipe. Chipotle peppers add subtle heat and smoky flavor. Soup season is the best season, am I right? As much as I love salads, (and believe me, you know this girl loves salad! ), there is just magical about soup season. 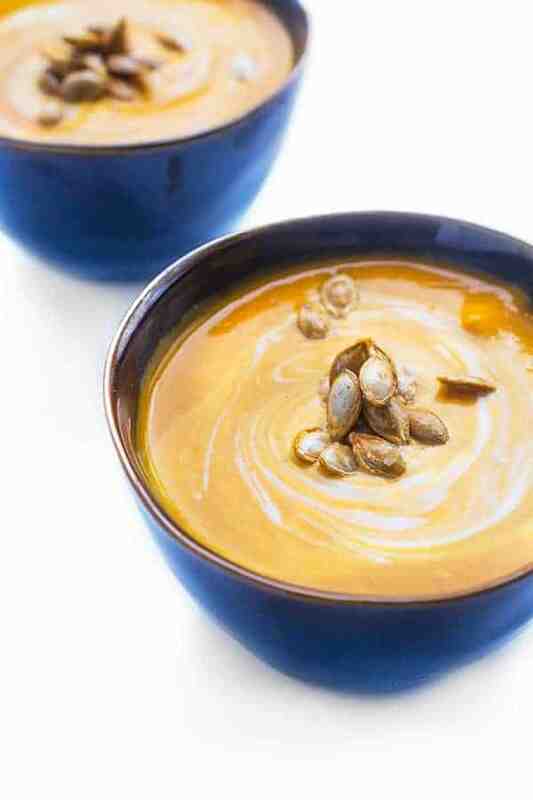 This creamy roasted root vegetable soup recipe is more of a rough guideline than a specific recipe you have to follow to a T. Ideal for any root vegetables you may have on hand, feel free to use whatever you have sitting around including potatoes, parsnips, carrots, squash and more. 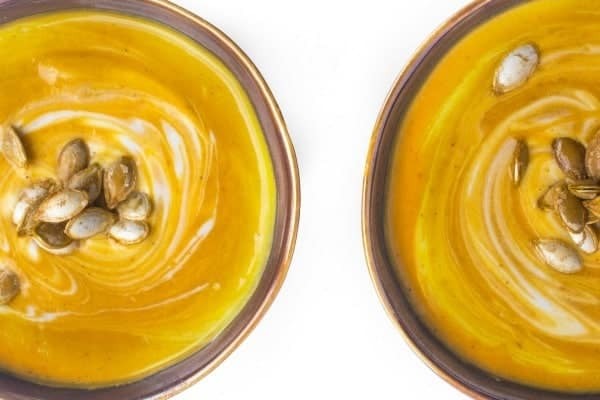 The real secret to this mouth-watering soup is the balance of sweet honey, smoked paprika and tangy whole milk yogurt. For added texture and crunch, I love roasting a handful of the reserved butternut squash seeds to sprinkle on top right before serving. If you prefer more of a kick, double the cayenne or puree a couple chipotle peppers in adobo sauce when pulsing the roasted vegetables. Want it sweeter? Drizzle in more honey. Prefer it creamier? Stir in more yogurt. Whatever you do, just make this soup your own. You won’t regret it. Root vegetables are drizzled with olive oil then roasted until sweet and caramelized in this simple but satisfying winter vegetable soup recipe. Pre-heat oven to 425 and line a baking sheet with foil. Place first 10 ingredients in a large bowl (butternut squash through cayenne) and toss until evenly coated in oil and spices. Scatter into a single layer and roast until vegetables are caramelized and tender, about 30-35 minutes. Remove vegetables from the oven and place in a high speed blender or food processor. Add honey and pulse until smooth. Pour mixture into a large soup pot and stir in the chicken broth and plain yogurt. Heat over medium high heat until warmed through. Check for seasoning and adjust accordingly before serving. 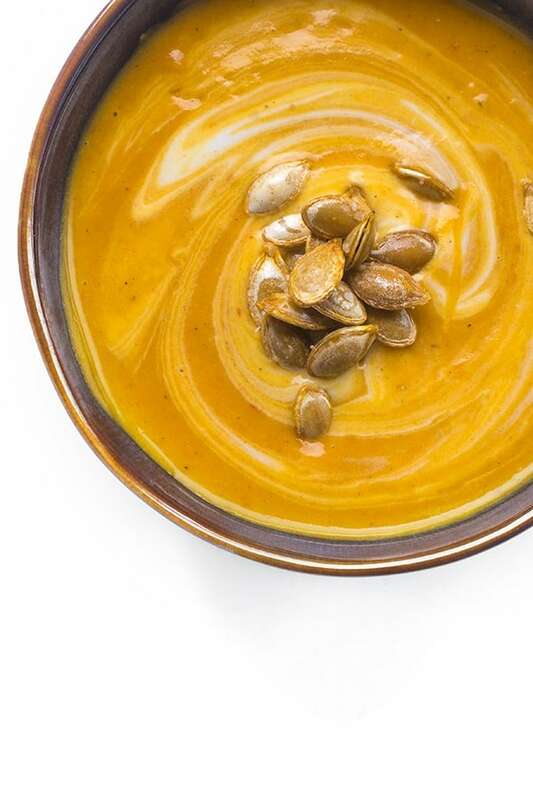 Optional: Lightly roast the reserved butternut squash seeds in olive oil, salt and pepper for 5-6 minutes while vegetables are roasting to garnish soup before serving. Click on my Pinterest board to see more of my soup recipes! About to make and very excited! What is the serving size though? Gives calories per serving but doesn’t say how big a serving is… I prefer to use weight to track calories. Serving is 8 ounces. Enjoy! wow, what a sophisticated recipe, love these flavors (always sweet potato!) honey and yogurt with paprika and cayenne pepper, love it! thank you for sharing this! Root veggies are so balancing in the cold months! This looks so creamy and delicious! Thank you. Seriously! Just what we need! Even though I’m not much of a soup eater, this one sounds great. I would definitely sub out the parsnips though – neither of us like them. A rutabaga might be a good choice. I could see serving this with something like your lemon basil grilled cheese panini… (or other grilled cheese sandwich).